Stocks Edge Higher After Drop In Jobless Claims - U. S.
The Dow Jones industrial average fell from its morning highs, but was still up 36 points in afternoon trading after the Labor Department said first-time claims for unemployment benefits fell last week to the lowest level in two months. A report that European banking giant Deutsche Bank AG is considering raising new money through a stock sale dampened the upbeat mood. Trading volume was very light. The jobs report came in much better than analysts had expected and added to other positive signals on the economy, including a pickup in job creation for August reported last week. Treasury prices and the dollar fell as investors stepped up their appetite for risk. "The employment report is still the king of kings," said Edwin Denson, head of market strategy at Singer Partners LLC. "The labor market is still the indicator, that if it's positive, would give people the most comfort." "All we need is slightly good news … relative to expectations and at this point expectations are relatively poor," said Tyler Vernon, principal and portfolio manager at Biltmore Capital Advisors. The Dow rose 36.63, or 0.4%, to 10,423.64 in late afternoon trading. The Dow had risen as much as 90 points and climbed into positive territory for the year earlier in the day. The Standard & Poor's 500 index rose 6.40, or 0.6%, to 1,105.27, while the Nasdaq composite index rose 8.45, or 0.4%, to 2,237.32. First-time claims for unemployment benefits fell to 451,000 last week, much better than the 470,000 expected by analysts polled by Thomson Reuters. But that's still well above the 400,000 level that economists say is a signal of strong economic growth and job creation. Yeah we are all saved!!!! In the week ending Sept. 4, the advance figure for seasonally adjusted initial claims was 451,000, a decrease of 27,000 from the previous week's revised figure of 478,000. The 4-week moving average was 477,750, a decrease of 9,250 from the previous week's revised average of 487,000. 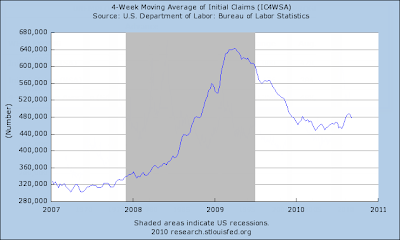 The weekly claims numbers are volatile so it's best to focus on the trend in the 4-week moving average. 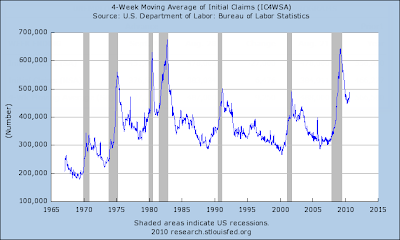 The 4-week moving average is still near the peak results of the last two recessions. It's important to note those are raw numbers, not population adjusted. Nonetheless, the numbers do indicate broad, persistent weakness. At some point employers will be as lean as they can get (and still stay in business). Yet, that does not mean businesses are about to go on a big hiring boom. Indeed, unless consumer spending picks up, they won't. With census effects nearly played out, It may be quite some time before we weekly claims drop to 400,000 or net hiring that exceeds +250,000. Three weeks ago there was a weekly claims print above 500,000. That number will roll off the 4-week moving average next week. Assuming another 451,000 print next week, the 4-week moving average would be about 465,000 - a decline of another 12,000 or so. Even still, the number will nothing to crow about. Moreover, I am still expecting lots of state cutbacks so that could have an impact. However, claims have been generally in 450,000 range for 8 straight months of sideways movement so we can easily see more of the same.